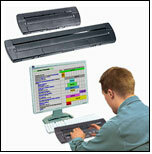 This Week's Featured Advertisement: One Refurbished Classic Focus 40 Refreshable Braille Terminal for USD $995.00!!! We start off the new year with a fantastic deal on an original Focus 40 Braille Terminal. This is a fantastic bargain for the desktop/laptop PC user looking for a 40-Cell USB Braille display for less than 1K! This unit is in pristine condition and works seamlessly with the globally acclaimed JAWS For Windows Screen Reader, along with all other commercial screen reading solutions. Price includes shipping within the 48 Continental United States and this unit will be sold on a first come, first serve basis. For more information, email featured@flying-blind.com or call +1 (216) 381-8107 today. 2) SixthSense is a new 3D sound horror shooting game for iOS which is reported to be quite accessible. 3) CAVI is offering the "Building Websites With HTML 5", "Audio Editing Fundamentals", "Computers 101 with Mac or PC", and other courses starting in February. Individuals generally pay $150.00 USD per course. 4) Fleksy is quite a popular iOS app among the blind. Here is a mainstream review of the App from the Consumer Electronics Show. 5) "Adventures In Android" is a budding blog chronicling one blind user's experiences exploring this operating system. 6) Learn how to burn CD's and DVD's with Express Burn on Tek Talk on GMT Tuesday, 15 January at 01:00. 7) National Braille Press has launched its own blog. 9) The entire hour of Main Menu this week is devoted to the new BARD web site from NLS.